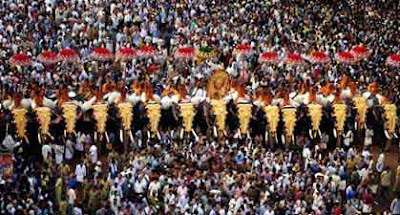 Two rows of caparisoned elephants facing each other separated by a sea of humanity is the image that comes to the mind when Thrissur Pooram is mentioned. Thrissur Pooram 2019 date is May 13. The Trichur Puram festival, referred as the Mother of all Poorams, is annually observed in the Malayalam month of Medam (April – May) and is noted for traditional Kerala music like Chenda Melam. Poorams are festivals held in Hindu temples in Kerala and the highlights being caparisoned elephants and Panchavadyam – a classical performance of five musical instruments. On the Thrissur Pooram day, the deities of the temples in and around Thrissur town pay customary visit to the Vadakumnathan Temple on caparisoned elephants accompanied by the music of Chenda Melam and Pancha Vadyam. The most important processions are that of the Thiruvambadi Shri Krishna Temple and the Paramekkavu Devi Temple. Apart from the two major temples, eight minor temples participate in the pooram. It must be noted that Vadukumnathan Temple, dedicated to Lord Shiva, remains a spectator during the festival. Although deities of temples meeting annually in a prescribed spot were observed earlier, it was during 18th century, Shakthan Thampuran, the Maharaja of Kochi, who took initiative to conduct Thrissur Pooram as a mass festival. Paramekkavu Temple and Thiruvambady Temple are the dominant partners in Thrissur Pooram. The arrival of the deities of the eight other temples is referred as Cheru Poorams or Small Poorams. But the areas representing the smaller temples detest the use of the term Cheru Pooram as they consider the arrival of their deity before Vadakumnathan second to none. The magnificent visit of deities from ten temples in and around Thrissur town to the Vadakumnathan Temple is the core theme of the world famous Thrissur Pooram festival held at Thrissur Town in Kerala. It must be noted that Vadakumnathan Temple, dedicated to Lord Shiva, remains a spectator during the entire festival. Lord Shiva receives the respects from all deities but does not take part in the Pooram. By noon crowds build in large numbers at Thekkinkadu Maidan (ground) with the `Madathil Varavu' procession of the Thiruvambady Sri Krishna Temple. The Paramekkavu Devi procession along with the accompaniment of Pandimelam enters the Vadakkunnathan temple. The scintillating and highly appreciated ‘Elanjithara melam’ (a classic performance of musical instruments) begins when the procession reaches the elanji tree inside the temple compound. The excitement reaches its zenith when the processions of the Thiruvambady Shri Krishna and Paramekkavu Devi temples face each other at the Thekkegopura Nada area. The `kudamattom' session held here is the highlight of the Thrissur Pooram. In the ‘kudamattom’, the two sides engage in a competitive display of colorful umbrellas of various designs. The famous fireworks display is held late in the night. From 2009 onwards the fireworks is environmental friendly with less deafening sound and more of color. One of the most anticipated events during the Thrissur Pooram festival in Kerala is the fireworks display. Thousands of people gather to witness the early morning visual treat created by fireworks. The fireworks during Thrissur Pooram festival is held early morning (the next day morning (4 AM) after Pooram) at Thekkinkadu Ground in front of Vadukanantha Temple in Thrissur. Two temples – Thiruvambady and Paramekkavu – compete against each other in making the display of fireworks grandeur and more colorful. The Thrissur Pooram comes to an end with the farewell ritual of Thiruvambady and Paramekkavu temples at about noon on the next in front of the Vadakkunnathan temple.